Taiwan KMT Honorary Chairman Lien Chan left for Asia-Pacific Economic Cooperation (APEC) summit, said he was looking forward to during the meeting with Chinese President Hu Jintao. So they’re on their way, or maybe here already. APEC doesn’t start until next week. What will the delegates and their teams do until then? Well, there are some preliminary meetings… and of course, they will have to visit Chinatown. There’s a little picture in the center of the page. Students at Iolani are gathering around a statue of Sun Yat Sen. The sidebar on the lower left describes his education in Hawaii. The statue in the sidebar is the one in Chinatown. 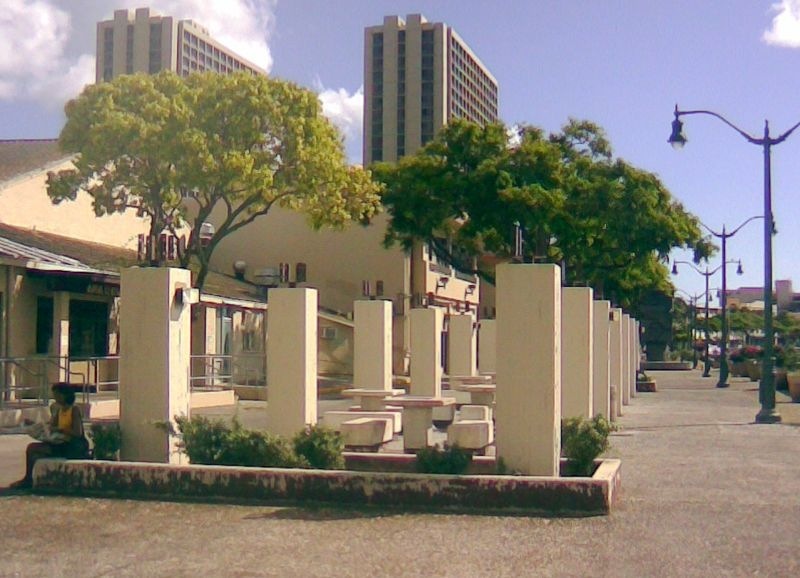 Unfortunately, except for routing the homeless tent community, Chinatown is pretty much as Mufi left it—with ugly posts where trellises used to shield chess players from the hot sun. The discolored (‘cause they remain unpainted) railings of the pedestrian bridge over the stream continue to crumble into the water. I hope none of the visitors sit on the railing for photos—as you can see, cracking is extensive, and the cracks go all the way through. Opposite Indigo, a classy restaurant likely to be frequented by APEC visitors, a derelict building still stands, partly covered by graffiti and in clear disrepair. Driving by today, I observed that the broken roof is gone, but the letters of the building name are askew. There’s a bit more graffiti now than when this photo was snapped. The building actually looks worse than this photo shows. While waiting for the valet service to bring the limo outside of Indigo, this is the view APEC folks will have. There was plenty of time to fix these things. Dude, the Lai Fong Au store is privately owned. Are you saying it was the owner's responsibility to fix it up for APEC? If so, why? Are you saying it should have done at taxpayer expense? If so, under what authority? Ir is your tongue planted firmly in cheek? Anonymous dude, I have no idea what might be done to fix the Lai Fong building. Only that it is ugly. Perhaps the city or the state does have some influence, but the point is that Chinatown will likely be a destination, and it has problems.